For the nitty gritty of tracking my portfolio I use Quicken (currently version Home & Business 2009). Quicken can automatically pull in both Canadian and US stock and mutual find prices, so if you enter the number of shares you own it will automatically calculate your portfolio value. Having the most recent quotes pulled in automatically is key here. US dollars are also auto converted to CAN. 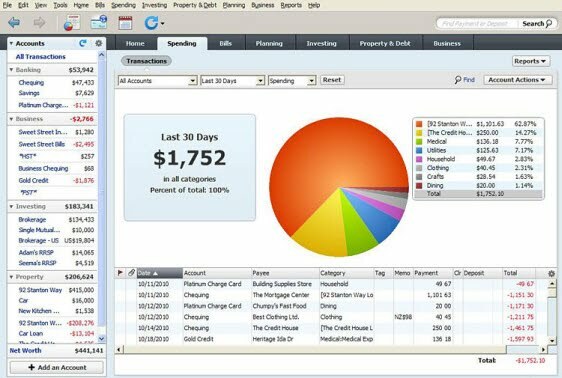 When I first started using Quicken I didn’t input any sort of investment history. I treated it as though I inherited everything on a single day and just started from there. Once every month (or two) I enter my share purchases and adjust my cash for any dividends paid. I have also enrolled many of our stocks in Synthetic DRIPS (this is covered in another section) so I also have to account for this as well. The main reason I moved away from Excel is that my Excel sheet was getting increasingly complex and I also wanted the ability to synchronize with bank accounts and credit cards. Quicken allows me to import transaction right from my banking website and credit card website. (I'm pretty certain all major banks are Quicken compatible..for credit cards you'll have to see what kind of on-line tools they give you). So now our entire financial overview can be viewed in one spot. I also use it to categorize our expenses so I can see where money is being spent. That said, I rarely actually check to see where money is being spent but it’s kind of addictive so I keep doing it anyway. You can also generate custom reports like ‘show me a summary of all the cash in all my accounts’ (useful for decision making). There are heaps of other features that I will never use like bill reminders and printing cheques. It will also attempt to show you related news articles, but the few times I checked it didn’t seem to be working very well (Google Finance or GlobeInvestor is best for this). Note - Unfortunately Quicken does not appear to be available for Mac users.